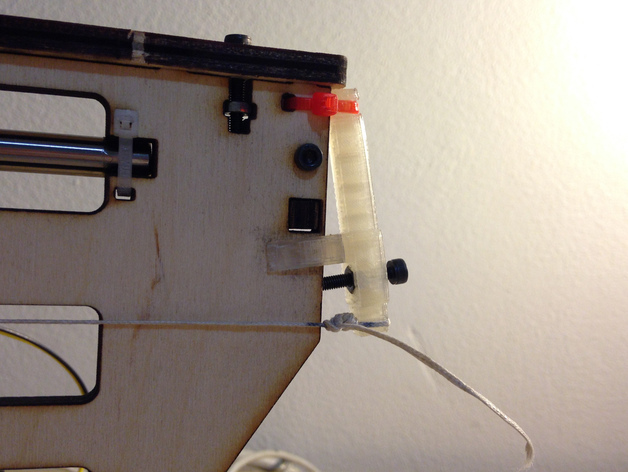 The original tensioner is assembled from two laser-cut wood parts, numbered 21 and 22 in the Printrbot Simple’s diagram. I exported the patterns per the process described in the post linked above and combined them using the following OpenSCAD script. Note that part 22 has a partly recessed socket for a hex nut, which I exported separately. The parts are aligned using positions reported for each feature in LibreOffice. The actual position on the page doesn’t matter; only the difference between them is used to get things centered. The STL exported from this script could be used to make an exact replacement for the original assembly. Instead, I imported it into SketchUp using the SketchUp STL plugin and made a few changes to simplify the part and make it easier to print without supports. This is the final version published on Thingiverse. Posted on Tuesday, February 11th, 2014.